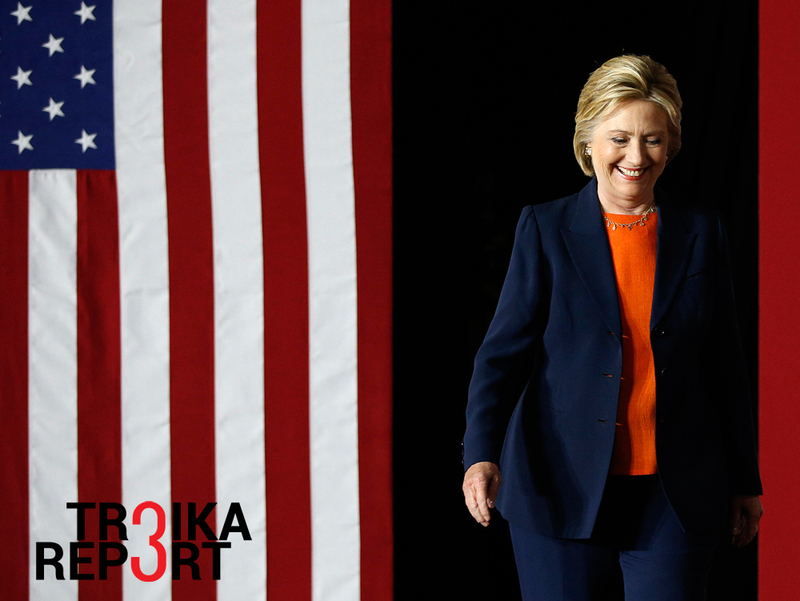 Democratic presidential candidate Hillary Clinton takes the stage before giving an address on national security, June 2, 2016, in San Diego, California. Hillary Clinton has warned that should her opponent, Republican maverick Donald Trump win the U.S. presidential elections, “They’ll be celebrating in the Kremlin.” Is she right? And does this mean that a Clinton presidency would be perceived as a disaster in Moscow? Speaking to supporters in San Diego on June 2, Hillary Clinton, now Democratic Party nominee for president, “defined her hawkish foreign policy” said Breitbart News Network (a syndicated news and opinion website), in an apparent attempt to sharpen differences with Republican presidential candidate Donald Trump for her electoral college. In contrast to her Republican opponent who pledged not to “seek war or aggression” (“America First” speech at Washington’s Mayflower Hotel), Clinton did not exclude violent actions to disarm Iran, and pleased the military by supporting the presence of US armed forces overseas to avoid what she termed a “vacuum” that would leave other countries free to dictate their will in global affairs. Meanwhile, the assumption that Moscow favours a Trump victory, based on the words of President Vladimir Putin about the GOP iconoclast (“[Donald Trump is] a really brilliant and talented person, without any doubt”), looks a little over-stretched. Asked to comment on Clinton’s statement that should Trump win the U.S. election “They’ll be celebrating in the Kremlin,” Russian presidential spokesperson Dmitry Peskov looked surprised. “What would be the reason for the ‘celebrations’?” he asked. Peskov went on to explain that Moscow would consider “the best” U.S. president the one that nets the majority of the votes of the American people despite the “peculiarities of the U.S. electoral system. If Clinton is elected president, should Moscow forget about any “reset” in the relationship and brace itself for a full-fledged Cold War that could even turn into a hot war? Mikhail Khazin, a well-known Russian economist with strong anti-Western political views, spelt out this view in a recent radio programme..
Fyodor Voitolovsky, deputy director at the Moscow-based Institute of World Economy and International Relations at the Russian Academy of Sciences, dismissed such doomsday forecasts as laughable when speaking with RIR. Do you believe that a President Clinton would be ready for compromises? “First of all, it is more important that we are ready. Moscow has vast experience in dealing with all kinds of American presidents. We have dealt with (Ronald) Reagan and George W. Bush. The latter changed the tune in the course of engaging with Putin, as you know. So it appears very unlikely that further worsening of bilateral relations might end up in an exchange of nuclear strikes. Nevertheless, to press the point, if Clinton moves into the White House in a remarkable political comeback, will it spell doom and gloom for Moscow? Vadim Kozyulin, a senior research fellow at the PIR Center, a Moscow-based independent think tank, suggested, while speaking to RIR, that Obama’s successor pursue a dialectical approach to U.S. foreign policy. Ergo, Donald Trump must be the preferred choice for Moscow? Is this not something that has been advocated openly by Hillary Clinton throughout her political career? Does that make the acceleration of the current confrontation with Russia an inevitable repercussion should President Clinton move into the Oval Office in January 2017? Basically, what Vadim Kozyulin is saying amounts to an axiom: Nothing is linear in the higher mathematics of foreign affairs. Similarly, Fyodor Voitolovsky advises against simplifying and over-personifying American politics. The intensity and format of “constant engagement” could vary, but nonetheless, it is a far better option, and both sides are aware of this.